After age 40, most people will experience presbyopia, a very common vision condition linked to aging. Typically, it becomes difficult to see objects close to your eyes clearly. Activities such as reading fine print or doing detailed craftwork become very challenging. Presbyopia is a normal part of aging caused by a loss of flexibility in your eye’s natural lens. In the past, the classic treatment for presbyopia was to wear bifocals or reading glasses. However, a lot of people are resistant to putting on this unsightly eyewear. Fortunately, there are now alternative treatments that work just as well to correct presbyopia and provide crisp vision close-up. Multifocal contacts are a great option for many patients, and our eye doctors are experienced in fitting patients with multifocal contact lenses in Greensboro. 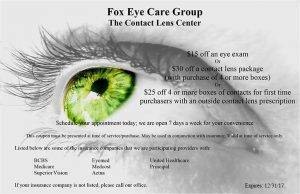 Contact us to book your contact lens eye exam and fitting at a Fox Eye Care Group office. Wearing contacts gives a level of freedom that glasses cannot achieve. With multifocal contacts, you can gaze in any direction and benefit from sharp vision. In contrast, with multifocal eyeglasses, you’ll need to move your eyes upward to see into the distance and downward to read a book. We offer a range of bifocal and multifocal contact lenses in Greensboro, including soft and rigid gas permeable types. What’s the difference between these two types of lenses? Bifocals are divided into two sections with different lens powers – one part for distance and one for seeing close. With these lenses, you will be able to switch between far and near effectively, yet it may be impossible for you to focus on anything at a middle range away from your eyes. In comparison, multifocals have many built-in lens powers, thereby enabling you to switch between far, near, and in-between with more flexibility. Simultaneous Vision Lenses allow you to see both distance and close simultaneously – as the name states. After a rapid adjustment period, your eyes will learn to use only the part of the lens that is required for focusing on what you want to see. Simultaneous vision lenses come in a concentric ring design and aspheric design. The most basic type is concentric, which is constructed with a central circle that has one vision power and an outer ring that has the alternate lens power. Extra rings can be added to form a multifocal contact lens, and the edges are blended to provide a smooth visual experience. Aspheric design Lenses blend many vision powers over the entire surface of the lens. Lens powers for both near and far are situated in the central area, and your eyes will adjust naturally to use the part of the lens that’s needed to see clearly. Translating/Alternating Vision Lenses are available only in hard, gas permeable versions. They are made with separate zones – top and bottom – and your eye will move to the necessary zone to see. Since contacts move around within your eye, these lenses are anchored in place with a thicker weighted area at the bottom of the lens, which aligns the lens with your lower eyelid. Bring Your Book Close to Your Eyes Again! Are you tired of holding books and restaurant menus far from your eyes in order to see the words, but you don’t want to put on reading glasses? We offer many types of presbyopia treatment at Fox Eye Care Group; schedule an appointment for an eye exam and to find out if you’re a good candidate for multifocal contact lenses in Greensboro.